I was introduced to Clare Mallory's The Pen and Pencil Girls by my friend Penni, whose childhood favourite it was. She lent me her battered, coverless copy years ago and I loved it almost as much as she did (not quite as much, because you just can't love books with the same passionate intensity after you grow up -- sad but true). BUT I loved it so much that I was very excited to discover my very own copy (with a cover!) in a pile of elderly books gifted to me by another friend and otherwise destined for the knacker's yard (or the pulping station). What a shame that would have been, because The Pen and Pencil Girls is gorgeous. 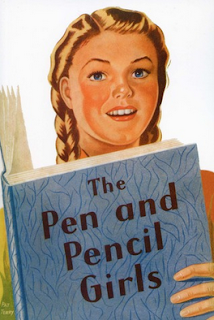 The Pen and Pencil Girls also taught me about the pride of the Southlanders -- it makes a nice change to have a kids book set in New Zealand, even one that's over seventy years old.